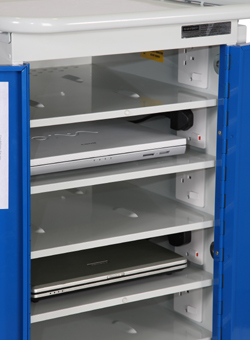 This narrow laptop charging trolley provides secure mobile charging facilities for 16 laptop computers in a slightly different configuration than standard units. 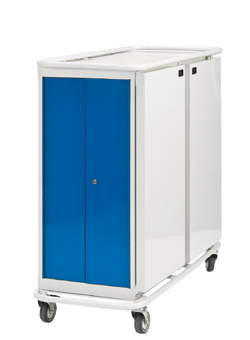 The slim profile allows the trolley to be stored and wheeled more easily between desks whilst still retaining good access to the laptops. Charging trolleys are most commonly used within learning environments where there is a need to transport a number of laptops between classrooms or even just to provide secure and practical storage of devices that remain in thr room. Each storage compartment comes with a standard 3 pin plug socket to allow any kind of laptop, tablet or media device to be charged safely. 2 x kettle leads are supplied to plug into convenient wall sockets (2 sockets required for full capacity charging). The all-steel construction with top and bottom bumper guards help to create a long-lasting piece equipment for your school.